Step in and say “ahhh.” With its lobby filled with overstuffed sofas, fresh-cut flowers, and an entrancing marble koi pond, the Genesee Grande transports guests away from the bustle of downtown and collegiate Syracuse. Guests can settle into rooms with ultra-comfy pillowtop beds, Egyptian cotton sheets, granite showers, and Aveda bath products, or one of four suites, including one with a Jacuzzi and another that feels like a luxe sunroom. The fitness center offers ellipticals, cycles, treadmills, and weight machines, along with flat-screen TVs to keep you distracted while getting in that full workout. A gracious and attentive staff and numerous freebies—airport shuttle, parking, Wi-Fi, newspapers in the lobby, concierge service—add value and convenience to your stay. Travelers with four-legged family members are welcome when Fido is mentioned upon booking. 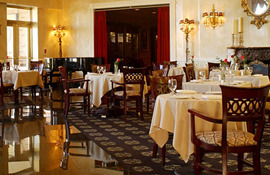 A casual ambience combines with rococo accents in the lobby-side 1060 Restaurant. Eclectic menus preside over breakfast, lunch, and dinner, accompanied by a deep and varied wine list. The adjacent lounge has a clubby feel with a piano, a large-screen TV, and signature cocktails. One of Syracuse’s more popular venues for wedding receptions and group meetings, the Genesee Grande offers a sumptuous ballroom, event planners, several conference rooms, and a theater. In the historic University Hill neighborhood on the eastern end of downtown, the Genesee Grande is 2 blocks from Syracuse University and 9 miles from Syracuse Hancock International Airport.